Cucumber, RSpec, MongoMapper, Git, Oh My! 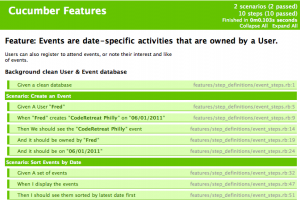 Using Cucumber to drive the new feature from the desired behavior à la BDD. For Cucumber, I added the “/features” stuff. 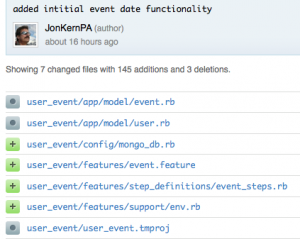 And since I wanted to start testing the code, I had to make the database functional, so I added “mongo_db.rb” – and I assume you have MongoDB installed and running locally. 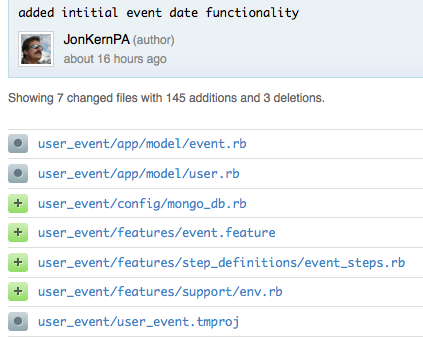 I am never quite sure if there is a “perfect” way to wire up small, non-Rails apps like this one to use MongoDB. But what I have done works good enough to allow for a simple example to run. Here I wanted to generate a set of data so that we could see if the list was sorted properly. You can check out the code on github for the randomness baked into the “dummy_*” helper methods. 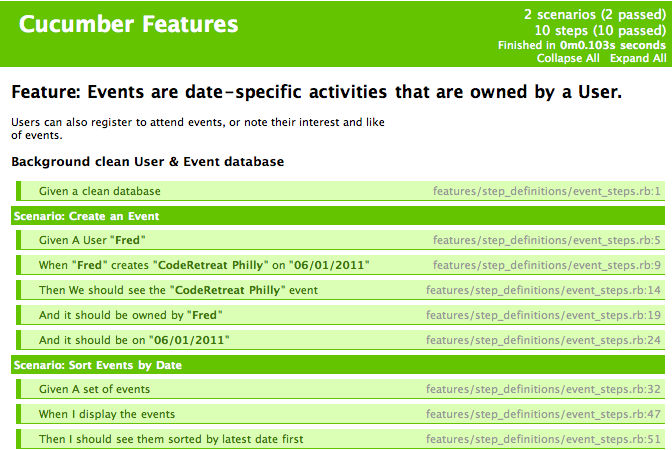 And I wanted to create the events for two users. The behavior expressed above (in Cucumber) can be thought of as more of an “outer,” acceptance/integration style of test. Typically it would be the User Interface (UI) – but I have been known to blur that line, since not all code is about UI and since Cucumber is so darn fun to use. Working at this outer level often leads to expressing what is expected of our actual code; in this case, that Event have a class-level method that returns a list of it’s instances (a.k.a., documents). Since we are talking about the behavior of a class, that is more of the “inside” of the application. Not something that an external user might care so much about directly, but rather something that supports the end behavior in an indirect fashion. 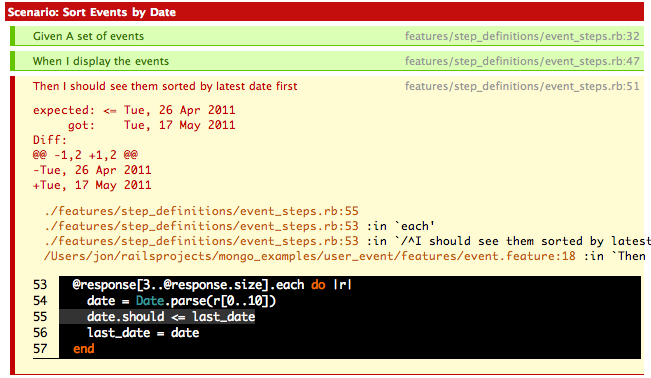 For the “inside” we turn to RSpec (basically a better-than-unit-test, unit test tool). Oops. LOL (:-D) While writing this post, I found a mistake when testing my code a bit further than my initial commit. 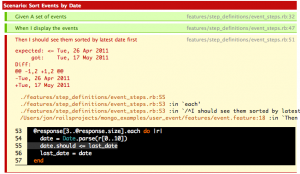 I decided to remove the order part of the query, which revealed that the Cucumber feature still passed. Crap! So, it wasn’t so easy after all! Dope. 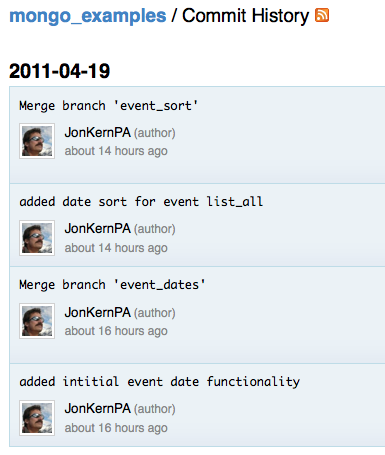 My initial way of generating records resulted in the documents magically being in the right date order by default. Tests passed, but the test was wrong – not vigorous enough testing! that contradict each other – so to speak. And similarly, I re-wrote the Cucumber test. Funny thing, further testing revealed that the error above was not actually a legitimate fail as it turns out! I discovered I needed “<=” instead of just “<“– sometimes the simplest things aren’t so simple after all. Especially when it comes to setting up sample data. And I got the above test to fail by “stepping back” and removing the “order by” clause to get me back to an original, non-sorted listing. Good! Now we can step forward again and try to get the functionality that we are looking for to work. This rhythm gets to be very familiar. I added a new feature that shows off the above query, quickly ran through the entire process again, from git checkout to git push, with Cucumber and RSpec and code in between. You can find it all in the source code. 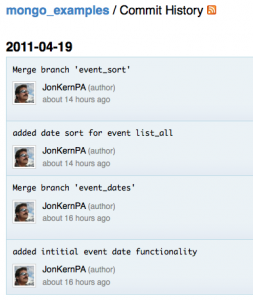 This entry was posted in cool tools, cucumber, Development, mongomapper, rspec, testing on April 20, 2011 by jon.